I do find Delia’s instructions for browning the onions to be lacking and I have never achieved beautiful brown caramel in 30 minutes – this stage takes most of the morning, in my experience. I prefer to make this with large sweet Spanish onions, when I can get them. but am not averse to using beef stock cubes (Knorr) as the real deal is rarely available in this household. I always add the optional cognac, it makes all the difference. I Googled around to see if the recipe is available on-line – because I make no changes, I can’t see a way around copyright to reproduce the recipe in full here. It was heartening to see that the recipe is there and that although Delia is nowadays less pretentious in naming it, the recipe is unchanged so far as the ingredients go. She does add some more sensible suggestion about browning the onions, however. Me, I shall stick to a long slow caramelisation and remembering to get up in time to start the soup soon enough. One final comment – I remember being taught to make French Onion Soup at school, in the late Sixties. 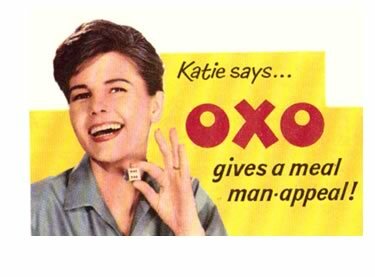 That was a time when “Beef Stock” equated to “Oxo Cube” – I thus spent a large portion of my life believing that French Onion Soup was a hideous thing. It is not, it is beautiful… just don’t use Oxo. OK? Delia knows better than Katie.